I’d never been a great fan of Bill Frisell, for some reason his music had never resonated with me until last year’s excellent Small Town with Thomas Morgan. There just seemed to be a clarity on that recording that I hadn’t heard before in his music, so I was interested to hear this solo album, which is his second ‘solo’ record since Silent Comedy in 2013 and Ghost Town in 2000. 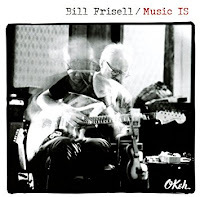 So across the sixteen tracks recorded on Music IS, Bill Frisell does it all on his own, with beautifully composed melodies being fleshed out with simple overdubs and clever and creative use of looping. Again, I’m not much of a fan of looping as it is so often clumsily used, where a repeated pattern just clunks away endlessly sounding nothing more than the machine that produces the sound as opposed to something organic, creative and musical. Not so here, Frisell’s deft touch and good arrangements of the various parts weave the repeated patterns into the fabric of the music to leave a satisfying whole. As well as all the writing and arranging, Frisell performs all the parts using a combination of electric and acoustic guitars, bass, ukulele, and various effects. Music IS contains a whole host of new pieces, but there are also some older pieces of his included on the album that have been given the ‘solo’ treatment. Tracks such as ‘Winslow Homer’, a piece that lends itself quite readily to a solo, ‘In Line’ and ‘Rambler’, which are respectively less Gamelan and Tijuana Brass sounding and more space age guitar, to paraphrase one of his more recent album titles, and a beautifully simple arrangement of ‘The Pioneers’, as well as ‘Monica Jane’. There is also an alternate straightforward solo version, without effects or overdubs, of ‘Rambler’ that ends the album as a bonus track. Out of the new pieces, some of the more notable ones are, ‘Change In The Air’, with it’s haunting melody that sounds like something on Mike Oldfield’s Hergest Ridge album, ‘Thankful’, a lonesome sounding melody with simple accompaniment that brings out the beauty of the piece, ‘Kentucky Derby’ full of reverse guitar sounds and swirling effects in a psychedelic –like manner, and ‘Ron Carter’ a tribute to the esteemed bass player. 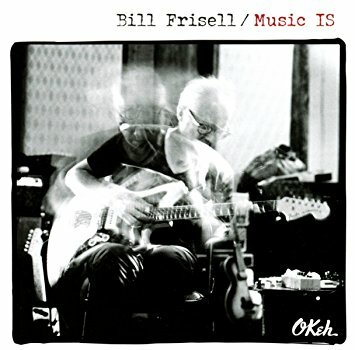 For a ‘solo’ guitar album, there is a wide array of colour across the pieces, and Bill Frisell chooses and uses effects to subtly shade the different parts within the arrangements, showing a lifetimes mastery over sounds that can quite easily mask and saturate the audio palette, using them sparingly and to good effect. As anyone who knows his work will attest, he’s not the sort of guitarist to just show off his chops, everything played has a function and an important part in the music. This is a truly excellent album where one can get to hear a wonderful guitarist and also a very accomplished musician in a solo setting. Frisell recorded a solo disc for Tzadik, Silent Comedy, in 2013. It's very good. Thanks Cap'n - text is updated.